“Baloney!” I murmured to myself remembering the shower of golden leaves that had greeted me when delivering gift baskets on the NAU campus earlier in the week. I glanced at the date, thinking I was in some kind of time warp. Nope. The paper was dated October 30th. Not at all. I’m in the gifting business. I, too, understand that many retailers have to make their profits during the last quarter of the year if they are to survive. But the commercialism of Christmas frequently tarnishes the magic. Let me back up a bit and explain what I’m trying to say. This year has been a year of lessons for me. When you reach my age, which, by the way, make me eligible for Medicare for the past ten years, you are a little more open to learning from experience that when you’re still under 39. Some people call it “old age stubbornness.” Others refer to it as wisdom. e-commerce company growing but GiftBasketNetwork, the worldwide directory and magazine for the industry, is doing well. The lesson learned is that working hard, being patient, and sticking to your dream for a number of years can result in realization of that dream. But, there have been other lessons learned as well which I won’t bore you with. The biggest lesson for me is that you never know what tomorrow will bring. As the familiar clique says, “don’t forget to take time to smell the roses.” And I’m doing exactly that. My customers will never know. They’ll still get the same quality service with the same quality products that they have always received. But I now take time out from a busy day to go to lunch with my husband and to go on a walk in the forest behind our house with our three dogs. The nip in the air and the falling leaves today were just another reminder that the year is almost over but there is still much to be enjoyed and savored. Grayson — my terrier born with only three feet–and Delilah–the dachshund with separation anxiety and Molly the poodle jumped with joy as they pranced through the golden and red leaves. 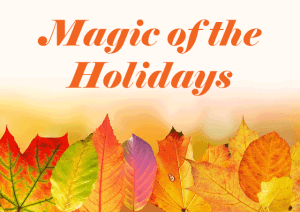 The magic of the holiday season can be enjoyed throughout the year. We don’t need an announcement that Christmas has arrived and it’s time to start shopping. I see the magic on a mother’s face when I deliver a gift from her faraway son. Or in the eyes of an excited four-year-old when an Easter basket arrives. You see, I’m not just in the gift business. I’m in the business of creating memories and magic. I’m encouraging you to not get so wrapped up into the fast-paced commercial-based “gotta rush. . .gotta buy a present” mentality that you don’t have the time to really enjoy the magic of this holiday season. Take each day as it comes. If shopping early gives you that extra time, by all means do it. If you haven’t created your own family traditions, this year is the time to do it. Don’t forget that Thanksgiving is a special day as well. It’s a time to give thanks and to enjoy those that are important to you. Don’t just rush out on the day after Turkey day to get “all your shopping done as quickly as possible.” Choosing a gift can be as important as the gift itself. Think about the person the gift is for and the reason you are giving that gift. What do they like and enjoy? What would mean more to them than anything you can give. Many times, the gift of self and time can be more important than any gift you can buy. No, Christmas has NOT arrived. The magic of the season and the time to show your appreciation and love in the form of gifts can be experienced all year long. Take time to savor the delights, enjoy those you care about, and the magic will be yours.